Finished panel measures 15" x 17 1/2"
Use grid paper to lay out center bevel design. Frame design with straight line bevels. Draw in break lines for background glass. 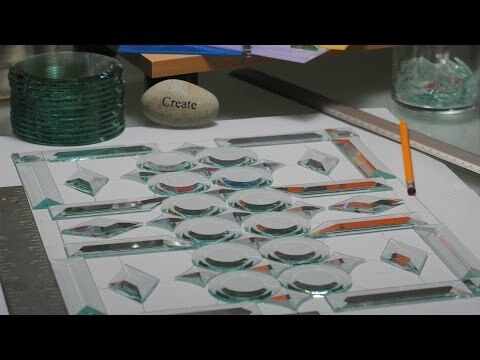 Enhance Your Stained Glass Project With Bevels! The slanted edges of bevels refract light into a rainbow of colors. Use bevels for windows, doors, suncatchers, lamps, candle holders and boxes. Click here to download the Free Pattern. Enlarge 53% to fit bevels to exact dimensions. Produce 2 copies of the sized pattern.